A chilly morning and a dodgy knee, contributed to a slow start from Kidderminster. 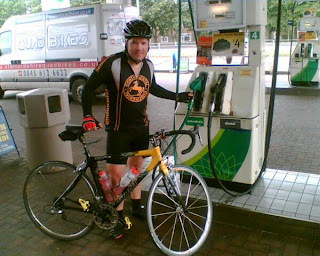 On arriving at Kidderminster the night before Ian missed his pedal while trying to clip in and jarred his left knee. A bit of a rub, a pint and early to bed seemed to have done the trick..... until he got back on the bike. Whether it was the cold weather or just the 270 miles in the legs, but Thursday morning didn't go well at all. But a good lunch (Tuna sandwich, Banana, Energy gel and a bottle of water) seemed to work and the afternoon went well, arriving in Warrington just before 5.00pm to fight through the rush hour traffic!! Lee's plodding on nicely - hopefully hiding the suffering.